Two weeks ago, I wandered from the orchids, palms and shark reefs of Las Vegas’s Mandalay Bay into the Luxor pyramid. In the center of the neon tomb, across from the Margarita by the Yard kiosk, were neighboring exhibits: Bodies and Titanic. Did anyone pause to consider whether stuffing a freak show of skinned, disemboweled, plastically mummified Chinese prisoners next to ephemera pilfered from a doomed liner’s resting place inside the replica of ancient royalty’s burial grounds built by the toil and blood of thousands of slaves seemed, I dunno, a little tacky? At the time, the thought didn’t occur to me. This was The Strip, after all. If you’re going to stumble into a morbid turducken, you’re going to do it here. 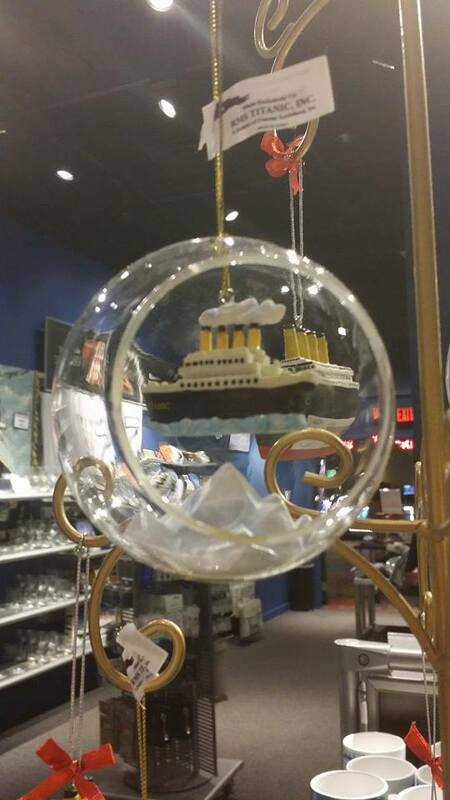 I take a hard-line stance against any of the Body World exhibits, but I can’t be so self-righteous about the Titanic exhibit. Not after being in line on opening day to see it back in 1998, when it opened at the Seattle Pacific Science Center. I was 14, I’d seen the movie 12 times, read all the dusty books the library had on the disaster, recited facts about the ship like kids today burst into Frozen songs, learned how to play “My Heart Will Go On” on the violin. Gawking at the real thing was the next logical step. Wandering through the dark cases of barnacle-scaled wine glasses and luggage still submerged in saltwater, I felt connected—as much as a teenage girl can connect to a pageantry of sorrow dredged up from a century back. The vague melancholy I felt peering at a lost man’s shoes was closer related to mourning Jack Dawson than real, vanished people. By the time we reached the exit I felt sad because I was supposed to feel sad. I’ve always been good at being overdramatic. Sixteen years later I was in the same pop-up of the gift shop, browsing the same trinkets they were selling in the 90’s. Even the souvenir I left with on my first Seattle visit was still on the shelf—a replica second-class dinner plate. After spending my teen years packed in a hope chest, the original plate met its end in my first apartment, when I stuck it in a 400 degree oven by mistake (the circumstances of which I can’t remember). I decided against replacing it. Instead of making me squeal and beg for an allowance loan, on this round through the shop, I cringed at every corner. The Beanie Baby teddy bears in captain hats, the Christmas tree ornaments, the White Star Line shot glasses. How long, I wondered, did it take before tragedy becomes fair capitalist game? On the eight-hour drive back home, I caught up on news headlines. The opening of the New York 9/11 Memorial Museum appeared in all of my feeds. I read about the speeches, the appearances, the conspicuous absence of Gee Dubya. At least they wouldn’t be dumb enough to put a gift shop in there, I thought. Because sometimes I give society far too much credit. How do you create a memorial for an event as complicated as 9/11? What space, what tribute can properly capture the individual grief of thousands, the shock and spiral of a nation, the ripples that divided our generation into pre- and post- worlds? You can’t. No one can; as Steve Kandell wrote in his must-read essay “The Worst Day of My Life is Now New York’s Hottest Tourist Destination”, everyone processes the happening differently. For those like Kandell, any display may be (understandably) too much. For others, all of the dust-covered artifacts and United We Stand throw blankets and sparkly crying eagle GIFs can never be enough. As an outsider to the raw intimacy of the terror attacks—I have never been to New York, I didn’t personally know anyone who was killed—I believe that everyone is entitled to mourn in their own way. If one family finds peace in silence, let them skip the fanfare. If others wear their heart on their sleeve and their In Memoriam cap on their head, rock on. As I unpack my revulsion, I find that it isn’t the objects themselves that bother me. It’s their placement. During that strange, awful, unforgettable September slipping ever further into history, I remember the early internet memes and unbridled pronouncements of patriotism. In the first days and weeks, cynicism was suspended. The political cartoons of weeping Lady Liberty and photographs of emergency crews raising the American flag felt genuine. In a way, necessary. What else could we do? But as the country went on, discarding the bipartisan unity with the holiday decorations and marching off to a war we still fight, the commercials for commemorative NYPD/FDNY coins and Bin Laden toilet paper began to feel more than stale. It reeked of exploitation. The Never Forget Pandora bracelets peddled the same building as over 1,100 missing people’s remains has the same stench. The existence of tourist destinations, by their mere definition, are debatable. Is profit from catastrophe wrong? Yes. Are designated areas of remembrance human and necessary? Yes. Throughout the world there are examples of the good dedicated to the very, very worst. For every Auschwitz Museum is a Tombstone, inviting you to “walk where they fell” and buy a t-shirt. The verdict on where the new 9/11 Memorial Museum falls along the spectrum will differ depending on who you ask. To have a museum devoted to this day is inevitable, probably necessary. Children born in the year of the attacks will turn 13 this year. Perhaps, above all else, this recreation of horror and heartbreak might bring their current world and its challenges into context. Hopefully more effectively than a traveling freak show of underwater treasure. Such an ambitious enterprise does need funding. But is an overpriced cheese plate really the best way to get it? The museum could take a cue from Auschwitz (yes, they do have a gift shop), which sells nothing but books and videos—no keychains, no commemorative pendants, no doggie coats. Perhaps move the items online, or at least across the street? And by all means, yes, hold fancy cocktail fundraising parties to siphon checks from rich donors. But in one of New York’s 18,000 restaurants instead of setting up an open bar on a mass grave. This isn’t Las Vegas, after all. There is plenty of commercial real estate in America without desecrating the 16 acres of Ground Zero. The intersection of the tacky and the tragic…there is something oddly American in that. Good reflection on what memorials are and should be. The 9/11 one of course hits home. I haven’t seen the memorial yet. Although I go to NY regularly, I’m ambivalent about it.